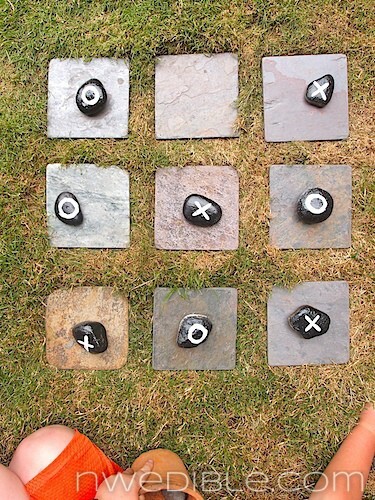 I saw a photo on Facebook yesterday of an outdoor tic-tac-toe board with stone markers. It was so adorable, and so totally do-able that I immediately ran outside to make my own garden tic-tac-toe game. This project was super fast and easy, required only stuff I already had kicking around, and the kids love it. 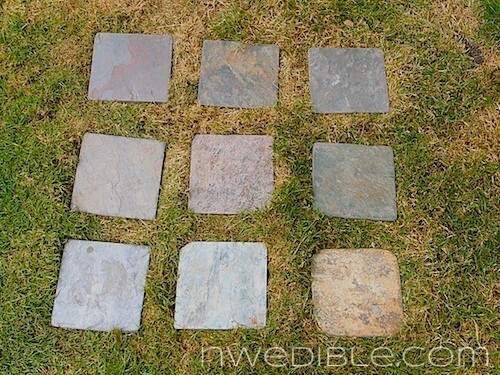 9 square tiles (mine were 6″ x 6″ slate tiles left over from our kitchen backsplash) or thin stone pavers. 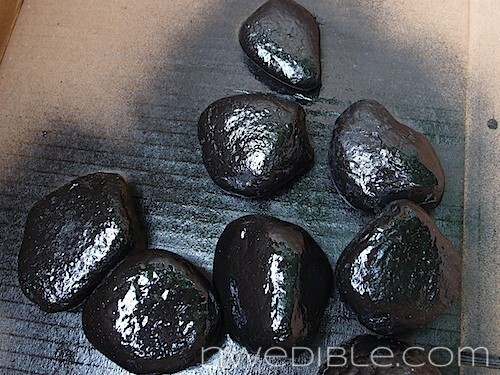 You guys know how I love spray painting rocks, right? 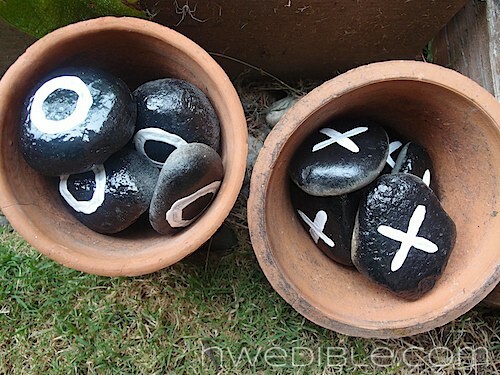 Give your tic-tac-toe stones a good coat of dark, textured spray paint and let dry. 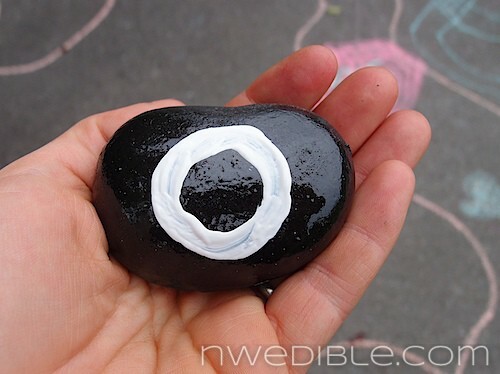 Use the white acrylic paint to mark half your stones with O’s and half with X’s. To play a game of tic-tac-toe you will need five of each marker. I made six of each because, with a toddler who helps in the garden, things tend to disappear. Lay out your square tiles or pavers in a 3-by-3 grid. If my tiles were a bit thicker, I would carve away the grass and bed them down. For this tiles like these, I just laid them on the grass. …and let the games begin! How do you add fun and, dare I say, whimsey to your garden? Part of me loves this idea. Part of me thinks of my three highly active teenage boys and sees a bucket of weapons. Too funny! I used ti plant sunflower teepees for the kids…..great fun!! Anne, I am sorry you are lame, some linamint may help with that, also wrap snuggly in a bandage and prop on a pillow and don’t forget the icepack to keep the swelling down. Your brain should feel better in a week or two. I think it’s adorable. If I had kids, I’d totally build in a hop scotch pattern somewhere too. In my own garden I don’t have a lot of whimsy save a few hand made mosaic tile pavers. I think I need more. Oh, and to the person who commented “lame”, why do you even bother? Unless you forgot the “I am” in front of your one word comment? As for a lame comment, what do you have for us? My kids wouldve loved this when they were little. They can help you choose the rocks as well, perhaps go rock hunting at a park. This is so cute and I can’t wait to do it with my kids this weekend. I have a few boxes of tile laying around from a bathroom remodel and wanted to do something fun with them! This is perfect. Perfect timing! Planning a party for next month where we advertise ‘lawn games’. Now I have a brilliant addition to the plan. Thanks! I’ve been wanted to do a bean pole teepee for my kids in their garden area too! So far it’s just a swing with a little garden of their own (calendula, sweet peas, carrots, tall corn rows) adjacent to the chicken coop because they love sitting next to the coop, feeding the hens bugs. I’d like an outdoor version of Mancala, but I guess it would end up looking like a birdbath. I think if would be fun for an outdoor chess board too (for older kids, adults), just stencil the image of each playing piece on flat rocks. Dude, I know what I’m making my dad for Christmas! Brilliant!! I am SO doing this this weekend! 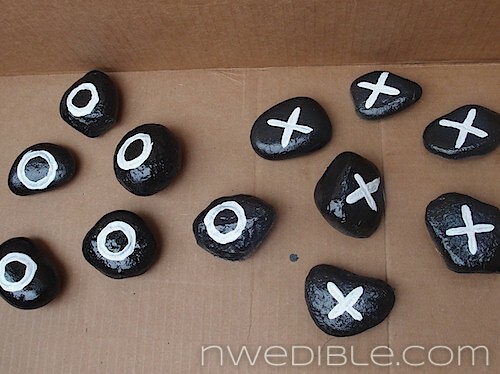 The kids (8 & 5) will love it because they always want to play tic-tac-toe. I have another idea for a kids garden too! We have a small public garden that is run by our Master Gardeners group in the area. They have an area for a kids garden and it includes a “sundial” of sorts. There are a series of concrete “footprint” stepping stones on the ground, and next to the footprints are rock labels painted with the months of the year. You step on the footprints next to the label that corresponds to the current month and point your arms straight up to the sky and your shadow (you do need sun for a sundial to work) falls onto a clock that is also on the ground, that tells you what time it is! It was very accurate too (within a couple of minutes). I googled “human sundial” and you can see pics of the idea, but none so cute as at our local garden. I’ll have to take a picture the next time I’m there. Brilliant idea ! It’ll give some cachet to my little garden ! Thanks . 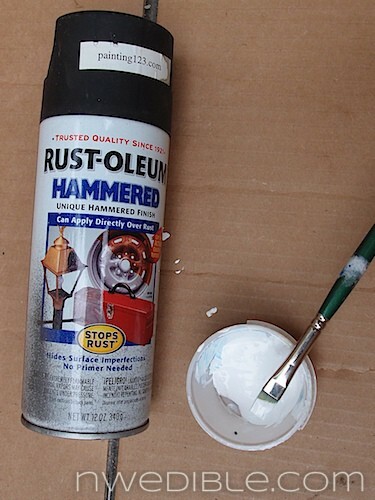 all that well…how about simply using two colors? What a great idea! As much as we love time in our garden this will definately be a wonderful addition. What an great idea. i will have to make this for my kids.